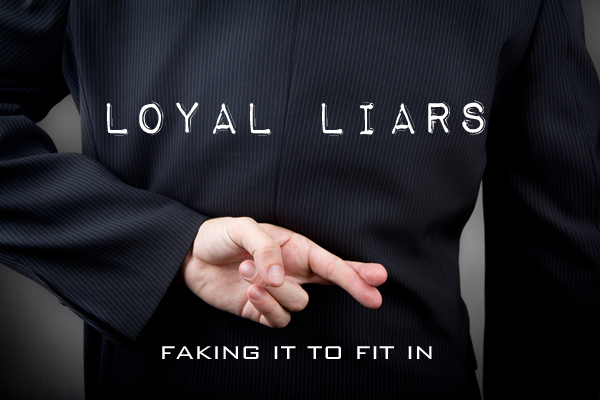 Years ago, a new term was introduced into church jargon: the Loyal Liar. It was first used in a fictional story about an older liberal professor mentoring a young Pentecostal pastor into giving up his faith, yet continue to be a pastor. He freely admitted that he’d left the faith years before, as had most of his bandmates, but they’d faked being Christians in order to continue to sell their music. He also estimated that only about 10% of the “Christian” bands they’d toured with, actually had Christians in the bands. On one hand, that’s what we used to call — in the olde days — a “no-brainer”. But on the other hand, this young singer has been around long enough to know that there are also a lot of worship leaders who would also fit the Loyal Liar persona. And in other conversations with 20-something worship musicians, I am hearing stories of increasing disillusionment about the number of their worship-leading peers who “play act” in worship, but don’t believe what they’re singing about. Encourage anyone you know that (as the singer said to me earlier). represents “the band that actually believes what they’re singing”. Pray like crazy for any Loyal Liars that you meet. Don’t judge them (remember the Pharisee in Luke 18?). Pray for them. An old expression that many of us have said many times: “Lord, break our hearts with the things that break Yours”.